Home /Knowledge Base /Getting Started Guide /Introduction: How Does Credit Repair Work? Home /Knowledge Base /Client Management /Introduction: How Does Credit Repair Work? Home /Knowledge Base /Payment processing /Introduction: How Does Credit Repair Work? Home /Knowledge Base /General Credit Repair Business Questions /Introduction: How Does Credit Repair Work? Home /Knowledge Base /FAQ /Introduction: How Does Credit Repair Work? 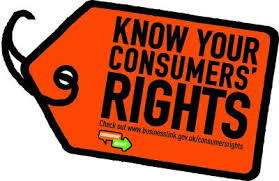 The Fair Credit Reporting Act gives you the right to dispute any item on a credit report. If the item cannot be verified, it must be removed. This is the basis of all credit repair. Nearly 8 out of 10 Credit Reports have errors! Errors come off quickly, usually after 1 letter, but even accurate items can often be removed. You just need to know the rules. Your client orders reports from all 3 bureaus; Equifax, Experian and TransUnion. The report imports into Credit Repair Cloud. Together you identify all the items you wish to dispute. Send a dispute letter to each of the 3 credit bureaus. Limit the letter to 5 dispute items (or fewer) within a 30 day period. 2-3 items is better. This is called Round 1. A few weeks later, the bureaus send a letter explaining items that have either been corrected or verified. Repeat step 2 (this time with just 1 letter for each single item). If bureaus respond that the item was verified, send another letter demanding proof of verification, a signature, etc. These letters are called Round 2, 3, 4, etc. Over time negative items are corrected and the score goes up! Client is thrilled and keeps paying your monthly fee! How do successful Credit Repair Companies make millions? 1) They give awesome service! 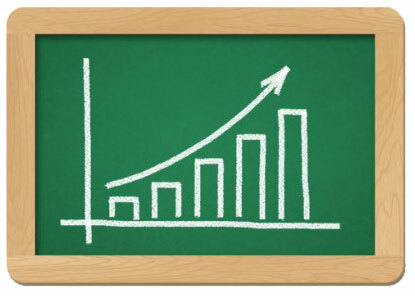 Your revenue will grow LARGER every month. 2) They have “affiliates” who refer clients to them! Affiliates are mortgage brokers, loan officers, realtors, CPA’s auto dealers and financial professionals who refer clients to you. Credit repair cloud has tools for requiting, managing and paying affiliates. Credit Repair Cloud is an all-in-one business solution to handle every part of launching, running, managing and growing a profitable credit repair business. Your client orders online credit reports and scores from one of these 6 providers. Of those 6, PrivacyGuard works the best. They charge $1 for a trial with instant access to all 3 reports and scores (a real bargain). Just remind the client to cancel the free trial if ongoing credit monitoring is not wanted. However, credit monitoring is an awesome tool during credit repair to monitor the reports and scores over time. Just sayin’. Later Rinse, Repeat! The actual Credit Repair “Work” is minimal. 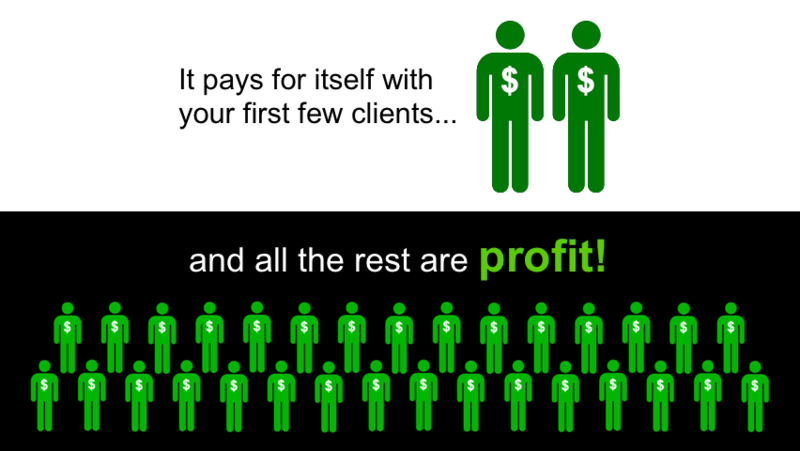 It’s about 5 minutes of work per client per month. Now lets turn it into a business. Credit Repair Cloud helps you to manage all of your contacts, clients, affiliate, leads, creditors, credit bureaus, tasks, deadlines and meetings all in one organized interface. It’s a complete all-in-one solution to start, run, manage and grow a lucrative credit repair business. Credit Repair Cloud integrates with an amazing tool called ChargeBee. ChargeBee starts at $49 a month. 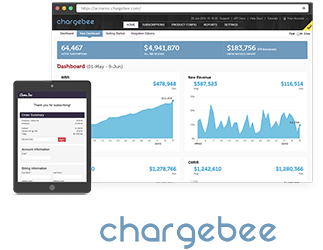 It’s understandable that you wouldn’t want an extra expense, but ChargeBee is phenomenal at what it does. You can enter the clients credit card information — or the client can signup with a credit card on your site and ChargeBee bills that client each month like clockwork. It sends invoices and receipts, it updates to the credit repair cloud accounting, it sends letters to clients telling them what to do when their credit cards fail, plus they send you awesome reports. ChargeBee does so much more. We recommend ChargeBee for anyone running a Credit Repair Business. ChargeBee works with most popular Merchant Gateways and you can try it free for one month if you sign up from within your Credit Repair Cloud. That tells ChargeBee that you need an account pre-configured for Credit Repair Cloud. Visit MY COMPANY>CHARGEBEE.. The MY COMPANY tab is where you add your company information that gets used in the other parts of the software, as well as in the Client and Affiliate Portal. It’s also where you choose settings and preferences for the different parts of your software. You can set an online agreement for your clients to sign on their first visit to the client portal. We have a default agreement already in your account. It has a document called “Authorization for Credit Repair Action” that most people use as limited power of attorney. Most people leave the default agreement as-is and only change the 1 paragraph about fees. 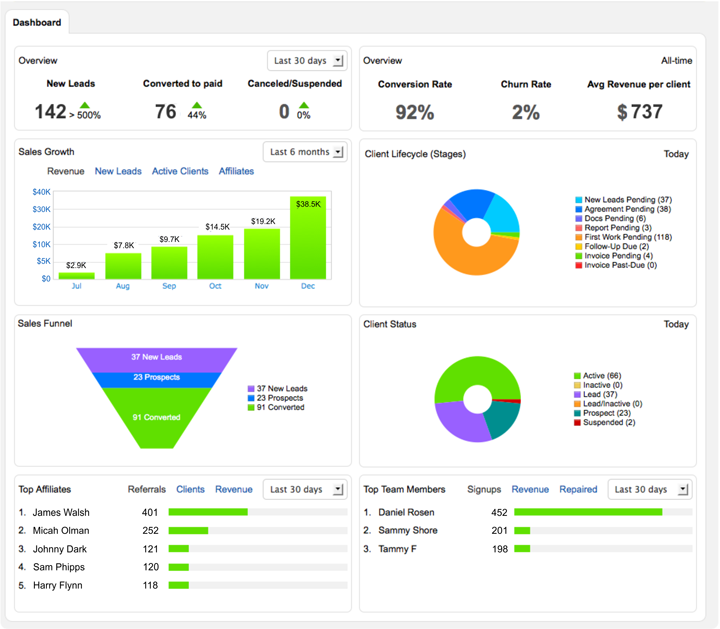 This dashboard shows a company overview with key performance indicators (KPI’s) to scale your business. 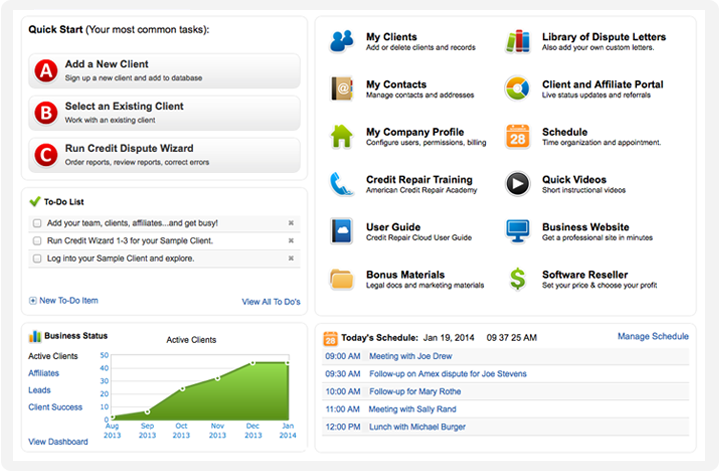 It can be seen by any admin or a custom role with appropriate permissions. Want to learn how to build a lucrative Credit Repair Business? Click here for the recipe. Want to calculate projected revenue? Use our ROI Calculator. In MY COMPANY>WEBSITE TOOLS we have different tools you can add to your website, so it can integrate with your Credit Repair Cloud. You can add these to any website you own. Using our web hosting at www.mycreditrepairsite.com is not required, but it does make it easy. What if a client gives you a PDF Credit Report or some other report that can’t be imported? No worries. Add the negative items yourself in the Dispute Wizard. You don’t need to enter the entire report, just add the items you wish to dispute. Credit Repair Cloud comes with 100+ letters. Most people use them as-is, but you can certainly modify them or add your own. By default the automated notifications are generic and only send with the options you choose in your MY COMPANY tabs. However, if you use our Mandrill Integration, you can modify them any way you like. Once you activate Mandrill in Credit Repair Cloud, all the emails will flow through your own Mandrill account, and Mandrill gives you awesome tools for monitoring delivery. We recommend Mandrill even if you don’t want to change the letters. Mandrill is awesome and a free Mandrill account lets you send up to 12,000 emails a month for free. There is no downside to Mandrill. Just do it!